This cartoon appeared shortly before the Democratic National Convention began in Baltimore. Having captured the presidential nomination at the Liberal Republican convention in Cincinnati, Horace Greeley now prepares to win the Democratic nomination. 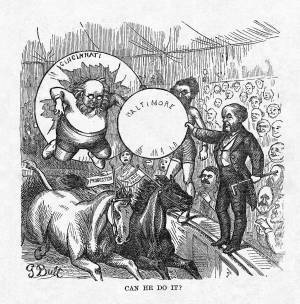 With the popularity of P. T. Barnum's "Greatest Show on Earth" and other circuses in the second half of the 19th century, cartoonists often chose the visual analogy of circus acrobats to politicians. Here, Senator Carl Schurz holds the Cincinnati hoop for Greeley, while Democratic party chair August Belmont holds the Baltimore hoop. The acrobat/candidate, a trade protectionist, attempts to straddle the backs of two horses, "Protection" and "Free Trade," the latter representing the position of most Liberal Republicans. In the front row of the audience, Tammany Hall Democrats (l-r) Peter Sweeny, William "Boss" Tweed, and Mayor A. Oakey Hall applaud Greeley's amazing feat of political dexterity.